The all too frequent 3:00 am wake up call came on the first Quest trip of 2014; the University of Michigan. This was the first trip where I not only had to not wake up my wife, but also not wake up the one year old Labradoodle, obviously named Gator, that has taken up permanent residence on the other half of my pillow. After successfully navigating that land mine, it was off to pickup Al, which is now much more convenient in Merrick than it was when he lived in Freeport. Love the new house Al! It is quite the experience flying on a Friday, in the fall, as a devoted college football fan. You really notice all the different people obviously going to their alma mater for a football game. For us on this trip, that started in the shuttle bus from the parking lot at LaGuardia Airport, at 5am, as a couple on the bus was decked out in Nebraska gear. Al is very quick with the CFQ business card and before they even sat down, he had his card in their hands and was talking Quest. Specifically, the Quest trip to Nebraska in 2012. Of course, they were intimately familiar with the game. We arrived at LGA Central Terminal, most assuredly the worst airport terminal in the country, and that is being very kind. The food court is before security, so we headed there for breakfast. This is the sign seen at breakfast….Prices here are similar to or lower than prices in comparable stores in the NY area. I must call b*** s***. I have never paid $11 for a bagel and coffee anywhere but inside an airport or CitiField. More pictures of why LGA Central Terminal is the best. [Look to the right] It’s the best, Jerry! The best! The large metal tube defying physics that we took to Detroit, had at least three people wearing Michigan gear. This is more than usual, but far less than I expect on every trip we take. The flight was uneventful, which is how I like my flights. I could not help notice the deep haze over Detroit as we came in for landing. The entire flight (I assume since I slept for most of it) was sunny and clear but when we hit 1,000 feet, we went through the cloud deck and landed in Detroit in the permanent haze that has enveloped the city since before its bankruptcy. Detroit has a mighty fine airport, perhaps this is where all the city’s money went. The only downside is the rental cars require a shuttle ride, which we did after navigating the crowd gathering in the lobby. Apparently the U.S. air traffic control system is so fragile, that one facility outside Chicago going offline due to arson from a disgruntled (what is gruntled?) employee, can cause O’hare and Midway to shut down. Hence, crowds in Detroit from canceled flights. We waited in line at Dollar Rent A Car, which I did not need to do since I am a Dollar Express member. But had we not waited in line, we would not have discovered what we call the “Detroit Rental Car Agent Hairdo” (patent pending). I wish we had taken a picture but there was no way to get it without being caught. I thought about getting Kramer to tell her the truth, but it probably would have backfired. Anyway, we got a Toyota Corolla with the tire pressure light on. Detroit Rental Car Agent HairdoTM #2 noted our account and then asked, “Was that sign on the car when you got it?” And with that, we were off on the 25 minute drive to Ann Arbor. Yes, it really was 25 minutes, not 25 minutes Jarrett time. While we drive to Ann Arbor, I must take a moment to give credit here to Al who has really stepped up his game this year. Al of his own initiative did the following; booked us on a campus tour, got all information and tickets for a facilities tour, did his pregame research before me and presented his findings which were very accurate, and secured our game seating. Nice job, Al! We arrived in Ann Arbor and parked at a garage that was clearly one pin drop away from utter collapse. The sign said preventative maintenance was beginning in July. FYI, it is September. We had a bit of time before our campus tour and I never really bought the $11 bagel, so it was time to really get some breakfast, at Frank’s Restaurant, one of the few remaining Ann Arbor greasy spoons, if they do say so themselves. After being warned by Frank’s wife (?? ), they were behind and it would be awhile, we sat. Two more Seinfeld references later and a pile of french toast, it was off for the tour. We opted to skip the one hour information session about the application process, academics, and other general high school seniory type stuff, so we had to catch up to our tour. We were in the Blue group which consisted of old guys with nothing better to do. Just kidding, the tours were clearly meant for those applying to the school, so the tour guide was more about “information” and less about “tour”. We were looking for the opposite. This was a great idea in theory as I thought this would be a great way for us to see the school, but in reality it was more about, this is how you do housing, and less about tour. A good thought, but next time we need to get a more customized tour. Al, get on that. We did learn that at the University of Michigan, classes start 10 minutes late. So a 3pm class really starts at 3:10pm. The theory behind this is so when your previous class ends at 3pm, you have 10 minutes to get to your next class. Other schools have solved this problem by not scheduling the next class right as the previous one ends, scheduling class blocks 10 minutes or so apart. Yeah, Michigan time! Perhaps this would have been helpful to Geno Smith this past weekend so he did not skip a meeting to go to the movies, although he would have needed a 3 hour time block from class to class. Another thing of note wandering around the Michigan campus, perhaps more than any other school to date, everybody had Michigan gear on. You would be challenged to find someone without some sort of Michigan paraphernalia on. That’s great! The University of Michigan has a very beautiful campus. I have been to the campus before during my teen years, but I did not remember it being this nice. Very picturesque! After the campus tour, it was off to the stadium tour, which consisted of the Crisler Center and Michigan Stadium. It would have been nicer if the stadium tour included all of the other sports facilities but we took what we could get. Al, next time, customized. Crisler Center is a very nice facility and we were able to walk around and even get close to the floor, but I got chastised when stepping onto the court as if there was a basketball game in 2 minutes and I was going to wreck the paint job. It’s a basketball court that is not seeing a game for months. You had to turn on the lights when we entered. Relax! A few people standing on the court will do NO damage at all. After Al reenacted Chris Webber calling timeout in the corner (yes, he knows it did not happen at Michigan), it was off to Michigan Stadium. We went up to the club level seats but again, was chastised when I went to step out into the seating area because I did not want to take pictures behind glass. Relax! All I am doing is going out to take a picture, not storming the field to dig up a chunk of grass two minutes before kickoff. After the club seats, we were permitted to go into the main bowl of the stadium. We even got to walk down the stairs to the front row. This place is going to look different tomorrow with a 100k people in it. After the official tour, we took a tour of our own. We went into the baseball stadium and saw some fall ball practice. Then we ventured to Yost Arena, the Wolverine hockey arena. Fondly remembering our time at the Miami University hockey game, we noticed a schedule which listed a club hockey game later at 10:30pm. We will come back to that later. After that it was on to Schembechler Hall’s Towsley Museum and a really cool wall of footballs. Our eating schedule was slightly off given the late breakfast and much walking on all the tours. So we headed to Zingerman’s for a late lunch / early dinner. Zingerman’s was a place that showed up on my radar from pre trip research as well as Al’s research. Also, it was recommended by my Uncle who has been to Ann Arbor many times as my cousin went to undergrad school here. So, it was a must and this was the perfect time. After parking way too far away because we thought it was downtown, i.e. more walking, we entered Zingerman’s. It was a Reuben for me, clearly not a kosher place. My Reuben was quite good and definitely a good meal. It will not make the top 5 list of meals on the Quest and being from NY, I guess I am somewhat spoiled when it comes to deli, but Zingerman’s can compete. After lunner, it was off to field hockey. It was our quest within a quest, to do as much sports and sports related items as possible on this day. One note about parking at Michigan field hockey…it is in a gravel lot that had lines painted onto the gravel. You do not see that every day, and there probably is a reason for that. During the off season, we failed to get a tutorial from my wife (yes Beth, I am still harping on this) on field hockey rules, despite her having played in high school, because she has no idea what the rules are. So off we went to Ocker Field for Michigan Wolverines vs. Maryland Terrapins field hockey. Ocker field has a blue turf field and I thought I was in Boise. It looked very cool. First field hockey observation…How does a male become a field hockey official? This is not a sexist question, I am seriously asking. Women officials in men’s basketball and vice versa I get. The game is the same. You learn the rules playing, then go into officiating. Even male softball umpires makes sense. The game is essentially the same as baseball and the rules somewhat similar. There is no male equivalent to field hockey. We have seen a few games now and still have no idea what the rules are. How does one who has not played, end up learning the rules and officiating this game? I do not get it. Due to Beth’s slacking, Al has been forced to initiate contact with a star player on the Maryland field hockey team and hopefully we will know the rules by next year. Second field hockey observation, parents are insane. This is not news. The couple in front of us, rooting for Maryland, had to be from NY. Typical insane father, ripping into his daughter and everybody else and generally flipping out, with mother embarrassed to be sitting next to him. I know this dynamic well. Third field hockey observation, how creepy do you have to be to go to a field hockey game with the sole purpose of ripping into an official who you know by name? This gentlemen, also directly in front of us, had no kid playing in the game and knew the referee by first name. And was talking to him and yelling at him the whole game. That is someone who will be on America’s Most Wanted. Fourth field hockey observation. Al got a twitter follow from Katie Gerzabek’s father. Don’t ask. Ms. Gerzabek was the best player on the field and probably knows the rules. A good place to start to finally understand this crazy game. Next up was Pinball Pete’s to kill some time before the club ice hockey game. Pinball Pete’s is an 80’s style arcade in downtown Ann Arbor. Games seen at PP’s; Punch Out, Donkey Kong, Pacman, and lots of pinball machines, but alas no pole position. Other than it being 100 degrees inside, a very cool place. After Pinball Pete’s, it was off to club ice hockey. We had no idea what to expect. If we thought we had no idea what to expect at collegiate varsity hockey, this was a complete unknown. We thought this was going to be a bunch of no talent, can’t skate, goof off’s messing around on the ice. We were wrong. This was high level hockey, played under the same rules as varsity hockey. There was a bit less hitting but the only noticeable difference was that Minnesota Duluth did not have any coaches. And, there were quite a few fans, mostly family, but still, we were not alone as I feared we would be. At the end of the second period, hunger crept back in. By this time it was 12:30am so the only real option was Buffalo Wild Wings, then bed as we had been up for almost 24 hours. After a very early wake up and late night on Friday, Saturday was a day for sleeping in. Morning was spent lounging in bed watching Ryder Cup. Do not get me started on that disaster. We missed breakfast at the hotel, so we headed out for tailgating and the possibility of finding some kind fans to take us in. We parked in our spot in the triangle lot, an aptly named gravel lot close to the stadium. After wandering around the somewhat sparse tailgates in the Crisler Arena lots, we learned that the golf course is where it is all happening. We checked out the golf course tailgating and were not impressed. Al would like to add that even with several months of networking, he could not obtain one invite to a tailgate. Not one. It is here that I must mention that all comments and ranking are based on one visit at a single point in time. We understand that there are deviations in many of the things we see based on how good the team is at the time we visit, how good the team has been in the immediate past, who is the opponent, and other random factors. Therefore, our comments and impressions of each school are not scientifically based on random samples. They are highly variable and we understand that. But, we only have the one visit upon which to comment and rank. So, that’s the way it goes. I am a big fan of this stadium. We would have to wait to see if this is a loud stadium, but from a design perspective, I am a big fan. After agonizing over my pick, and seeking a viable reason to be able to pick Minnesota, we both end up picking Michigan. I clearly over thought it and should have gone with my gut. Boy do we stink at our picks, and they are done straight up. We picked seats in the end zone near the top of the stadium and watched the stadium fill up, or not fill up as the case turned out to be. The student section was sparse. 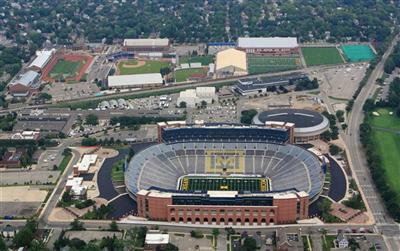 The 2013 enrollment at the University of Michigan was 43,710. Again, I repeat that the student section was not full. With that many students, it should always be full. I understand the issues around the students not happy with the AD, yada, yada. This was shocking to me. Announced attendance of 102,926 is a scam, but Michigan keeps their streak of games with over 100k intact, at least until they decide to become honest with themselves. The game did not start out that bad for the Wolverines and the 1Q ended scoreless. The alumni were even standing on 3rd down, which is not something to be taken for granted. We have been some places where on 3rd down it is only the students that stand. It is a good thing for Michigan the alumni stand, because if it was left to the students there would not be many around to stand up. Early in the 2Q De’Veon Smith drove the ball all by himself, 4 plays, 47 yards all Smith runs and Michigan led 7-0. Minnesota answered and we had a 7-7 game. Minnesota got a field goal at the half to lead 10-7. The 3Q is where it all went wrong for the Wolverines. Michigan started the 3Q, three and out. Minnesota returned the favor going three and out as well. Michigan, not to be out done, went three and out again, gaining no yards. Minnesota gained 8 yards and kicked a field goal to extend the lead to 13-7. Thank goodness for field position. On the next possession, Shane Morris gifted the Gophers an interception which was returned for a touchdown, 20-7 Minnesota. Three plays later, Shane Morris fumbles. Five plays later, a Minnesota touchdown makes it 27-7, and the wheels are officially off this bus. Three plays later, Michigan punts. The rest of the game is not worth commenting on except to say the final was 30-14. Now let us talk about what happened in the 4Q with Shane Morris. Shane Morris took a hit that left him quite wobbly. It was clear to us up high, that it was a head injury. Coach Hoke left him in for another play. To me, I can understand this. Shane waived the staff off after the hit and seemed to recover enough to stay in the game. Things happen very fast on the sidelines, things can be missed, and there is a rush to call the next play and communicate the play into the field, and the player himself indicated to the coaching staff that he was fine. After the next play, Coach Hoke put Devin Gardner in the game. Two plays later, Gardner’s helmet came off and he had to leave the game for a play. Shane Morris came back in and handed off. In my opinion, this is the inexcusable part. At this point, the medical staff and trainers would have clearly had time to analyze what happened to Morris and should have been examining him. The third string QB could have gone in and handed off. To send Morris back in, was inexcusable. Turns out, Morris suffered a concussion. This is not second guessing and I said exactly this as it was happening. The criticism of Michigan is certainly because of the play on the field and with the administration. Certainly if Michigan was undefeated, the uproar would be much less and the fan base would be defending the decision as Coach Hoke didn’t know. That would be equally wrong. The fan base is using this as a last straw argument and the smoking gun. It is the direction of the program that is motivating them. That is wrong and misses the point as well. Football in general is under attack for a variety of health related reasons, but most specifically, head injuries. There is much more known today about the health risks and long term head injuries from collisions on the football field. More can be done to minimize the health risks and make the game safer. Coaches, administrators, and other stewards of the game must look at player safety as priority one. If not, the critics will be correct. Players want to play and will minimize their injuries to be out on the field. It is not the coaches job to know the unknowable, especially if the players are deceptive. But in this case, even with the deception, the coaching staff and especially the trainers should have stepped in and taken Shane Morris off the field. Actions like this will give critics the ammunition they need to pass judgment on the lack of safety within the game. It is simply unacceptable. Better procedures are needed to protect the players to preserve the great game of football. At this point we want to give a shout out to Don, our personal tour guide of Michigan. It did not start out this way, but Don took very good care of us shepherding us around as we seemed to bump into him at every turn. Don was one of the six tour guides on the stadium tour. We had some conversations about our Quest, Michigan football, Michigan sports, and some other interesting items. We then ran into Don at the field hockey game. Then we ran into him at Michigan Stadium. He gave us a quick orientation of the press box and was good with a lot of tips and suggestions of what to do and things to see. A tip of the cap to you Don for making our visit a pleasure. After the football game it was off to the Michigan Wolverines versus Michigan State Spartans in women’s soccer, in our quest to see almost every sport in season within two days. Due to a serious lack of understanding of where the soccer stadium was (it is not just over the tracks) and very bad directions given to us by police officers and Michigan personnel, instead of taking the car we had a 5 mile hike. Not really it was closer to 1.75 miles but after all the walking we had done to this point, it seemed very far. And the kicker was, the stadium was packed, there was no seating, so we left, and had to hike all the way back. Dinner was at Tio’s, home of the Mount Nacheesmo, a 5 pound plate of nacho’s featured on tv by Adam Richman. It also garnered positive reviews and came up repeatedly during pre trip research. Unfortunately, it did not live up to the hype. The food was just ok (I did not opt for Mount Nacheesmo) and the service poor. There was nothing memorable and its claims of so many types of salsa fell flat when we ordered chips and salsa and were only offered mild, medium or hot. Sunday morning brought another lazy morning filled with the debacle that was the US Ryder Cup performance. It was so bad, I just could not look away. The Quest hopes to go to the 2022 Ryder Cup at Bethpage. Hopefully by then we will have some players who can play foursomes or we will have joined forces with Canada and Asia to make the Cup more competitive. Once we rolled out of bed and missed breakfast at the hotel, again, it was back to campus for a few last minutes pictures and the usual us with a school sign that we always seem to not get during the rest of the trip. For some reason we did not try to go on the field at Michigan Stadium. I guess we saw enough of the stadium yesterday and the day before during the dam tour (Vegas Vacation anyone?). How many pictures of empty stadiums can one take? We probably have the record. Then it was off to the airport with a side trip to the Ypsilanti Ihop. We definitely took the long way, seemingly going in a circle. Let me don my management consulting hat for a second… the Ypsilanti Ihop has very poor management systems. I do not fault the staff because this is clearly a management or lack of management issue, but is there not a better system than having your servers say “coming out” every fourth trip into or out of the kitchen, especially when there are two doorways. Is using one as “in” and the other as “out” too confusing? Do collisions only happen every fourth trip? Or do the servers forget the other three times? Or the less obvious answer is that there is an illegal craps game in the kitchen. New shooter coming out. That must be it. -Michigan colors are Maize and Blue. Isn’t maize corn? How did it become a color and why isn’t it called yellow? -I win my bet with Al, that the Michigan campus is Long Island west. Fall 2013 undergrad enrollment, NY is second to Michigan in number of students with 1,574. Pay up! -Quote of the trip….”Michigan students are shapely”. Yes Al, round is a shape. Just kidding! This was uttered in a most positive manner. The Minnesota Golden Gophers would go on to a very successful season finishing 8-5, which was good for second place in the Big10 West. The season ended with a loss to Missouri in the Citrus Bowl. The Gophers had wins against Michigan and Nebraska while four of their five losses came against ranked teams. The Michigan Wolverines were not as successful finishing the season 5-7 and failing to reach a bowl game. Head coach Brady Hoke was fired after four season and a 31-20 record. In a surprisingly adept move, Michigan was able to hire Jim Harbaugh away from the NFL as their next coach and the future is looking bright for the Wolverines. Hey Donnie Boy, (do you know how long it has been since I was called a boy?? ), here. Glad I was able to help you a bit and if you are back out in this area again, give me a shout….